OOOHHH I really LOVE that! I'm thinking you could make this for about $10.00; ribbon, and some goldtone charms that they sell at most craft stores. each charm is about $1. or less. That would be SO easy to make! Michaels & other craft stores sell charms like that & ribbon too. If you have a 40% off coupon that you find in their flyers it would be even cheaper. I'm totally inspired to make one!! i agree with everyone else - definitely a super easy DIY. & quite adorable! I like the blue a lot better than the green. But don't pay $24 - it's a wicked easy DIY. I'm going to jump right on the bracelet bandwagon; Michael's, here I come! like everyone else has said, it's an easy DIY project. try looking for charms at a bead store in your area as well. my local one has a pretty good selection. I'm going to add my voice to the chorus :o)-- totally agree about the DIY! 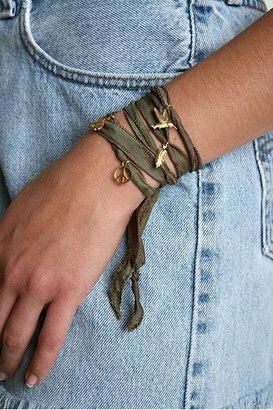 I would make mine more similar to the bracelet in the picture on top, I think the knots add to its charm. Equip store in New Zealand and OZ had simlar wrap bracelet.